Tweens have a heavy hand in ruling the trends of the Twittersphere. With important global news and cultural events flooding the front pages of international sites, how did pop sensation Justin Bieber push his way to the top of Twitter…again? With heartbreak. Bieber and his girlfriend of 2 years Selena Gomez broke up last week. Millions of Bieber fans flocked to Twitter to support him, consequently turning #StayStrongJustin into an instant global trend. And if that isn’t enough, alternative versions of the Tweet included combinations of “Selena and Justin,” which came in second place. Fun fact: during a show in Boston last Saturday, Bieber sang pop idol predecessor Justin Timberlake’s break-up song “Cry Me a River,” just days after news of his own hit the tabloids. 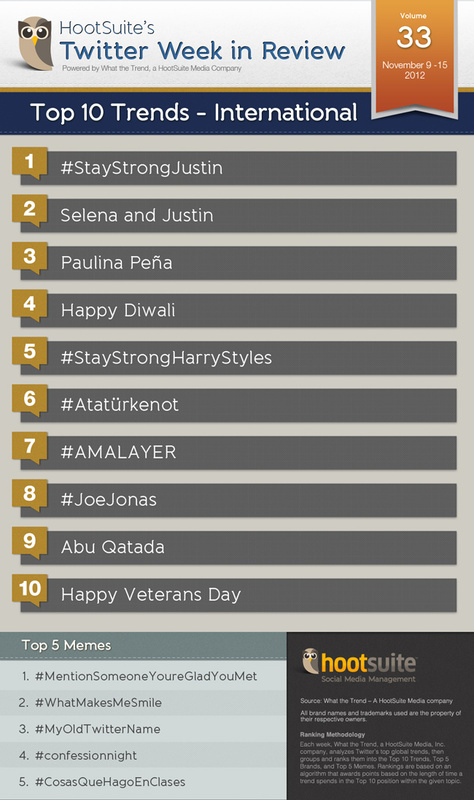 As we’ve seen with past trends, Bieber tweets might actually have been helped along by many Twitter users who were upset that he was trending above Happy Veterans Day, which just squeezed into the charts at number ten. Another pop cultural trend is Paulina Peña, the daughter of Mexican president Enrique Peña Nieto. How is she related to pop culture? Apparently, she is one of the most hated kids in Mexico at the moment after her father bought out five full rows of seats just for her and her sister to watch a One Direction performance in Mexico. Legions of One Direction fans took to Twitter in a blind rage insulting Paulina and her father for depriving other diehard fans of seats. While pop trends cleaned up the top of the charts, some important cultural and political events also trended this week in the Twittersphere—enough to claim positions in our chart this week. 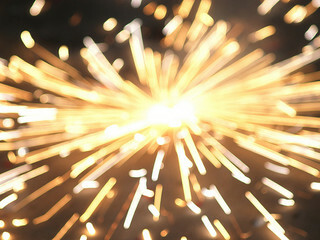 One of this week’s major cultural trends is Happy Diwali, which is often referred to as the ‘Festival of Lights.’ This five-day festival celebrated by Hindus, Buddhists, Sikhs, Jains and Arya Samajists around the world. While there are different traditions associated internationally with the holiday, it unanimously celebrates the triumph of good over evil. As a sign of celebration and hope for humankind, people light candles in their homes to ward off the darkness and invite illumination and prosperity in. And last but not least, is the man who will be monitored 24/7 from space. Terror suspect, Abu Qatada was released from his high-security prison after a court ruled that he cannot be deported from Britain to Jordan to face terrorism charges. According to BBC News UK, “the home secretary has branded the ruling ‘deeply unsatisfactory.’”Abu Qatada, a Palestinian-born Jordanian cleric, was convicted in 1999 and 2000 in Jordan over terror plots. Once described as Osama bin Laden’s right-hand man in Europe, Qatada will be monitored around the clock at a cost of £100,000 (US$160,000) a week. This massive surveillance operation includes watching his every movement from space via an electronic tag. 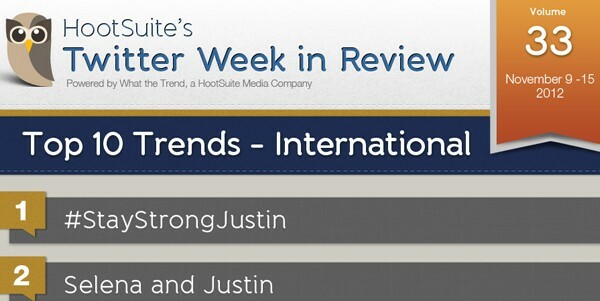 Join us next week for another look at International Trends of the Week.